Otherwise known as Orbeez, Dragon Eggs, Fairy Eggs, Water Balls or Crystal Soil, Water beads are a super absorbent polymer which expands to 100x it's original size in water. We have the biggest Range in Australia at the best wholesale prices. There's 17 Brilliant Colours to choose from - as low as 50c per packet! Bob is a box of beads, 60 packets in fact. But he' a whole lot more than that. He's jam packed full of free samples too! Bob's your friend if you're into markets, have a small shop or just want a little of the best to get started. He really does sell himself short though. Bob is easily worth $199 on the street but you can take him home for just $40. We'll even dress him in bubble wrap so you've got something to play with while the beads expand! BONUS COUPON INSIDE! 20% Off Your Next Order of Water Beads! Add a touch of elegance and class to formals, weddings and functions. 6 shimmery colours to choose from - as low as 72c per packet. They're as big as golf balls and much more fun! 20g Resale Packs and 500g Bulk Bags in a great range of colours. Super micro water beads expand to around 2mm. They're perfect for making cooling neck scarves. Create a winter wonderland all year round with instant snow! Choose from sachets, jars, test tubes, bulk bags and cartons. Reusable, long lasting, safe & non-toxic. Our bright Magic Sand is made of 100% natural sand with a little magic polymer to make miracles happen! Magnetic Thinking Putty is truly amazing! It interacts with magnets, flows like a liquid but bounces like a ball. 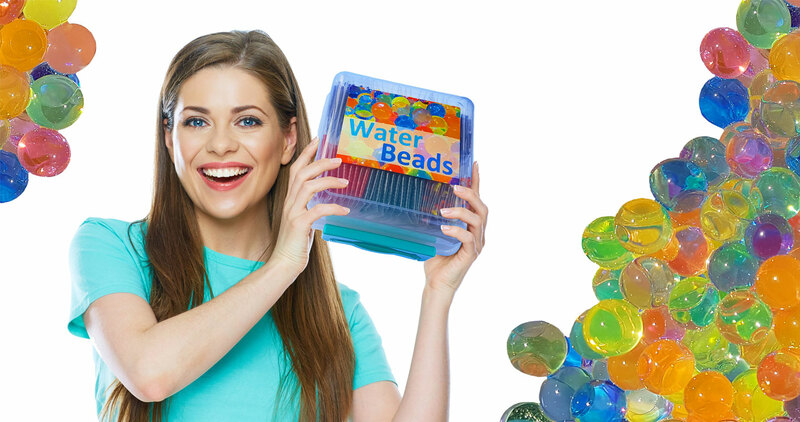 Want to Sell Water Beads? If you've got a shop we've got what you want! Retail Ready Water Beads packages - perfect for your counter. Start a market business or build an empire with our starter kits and packages for stall holders. Brilliant waterproof LED lights will turn amazing water beads into extraordinary water beads!